Kedarnath, at the head of the Mandakini River, is amongst the holiest pilgrimages for the devout Hindu. The temple, believed to be very ancient, has been continually renovated over the centuries. According to legend, Lord Shiva wished to elude the Pandavas, and took refuge in Kedar- nath in the form of a bull. On being followed, He dived into the ground, leaving behind His hump of the surface. The hump is worshipped in the temple of Kedarnath in the conical Shiva pinda form. The remaining parts of the body are worshipped at four other places — the arms (Bahu) at Tungnath, face (mukh) at Rudranath, navel (nabhi) at Madmaheshwar and hair (jata) at Kalpeshwar. 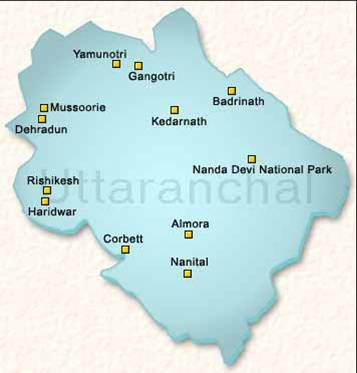 Together with Kedarnath, these places are known as the Panch Kedar. The lingam at Kedarnath, unlike its usual form, is pyramidal and is regarded as one of the 12 Jyotirlings. 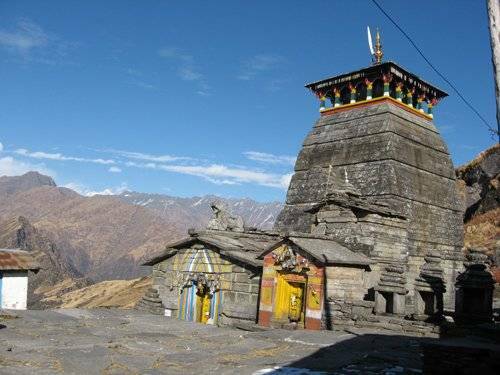 Set on the crest of a hill at an altitude of 3,886 meters, Tungnath is the highest temple in India. Legend has it that the arm of Shiva appeared here. Ravana, of the Ramayana, is said to have performed penance at this temple to propitiate Shiva. Built of stone, this temple is a fine model of ancient architecture. 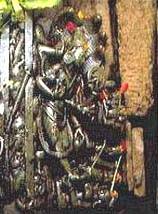 Facing the gate of the temple is Nandi, the Divine Bull and Shiva's vehicle. 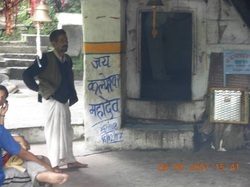 There are two smaller temples dedicated to Parvati and Vyas in a small courtyard. 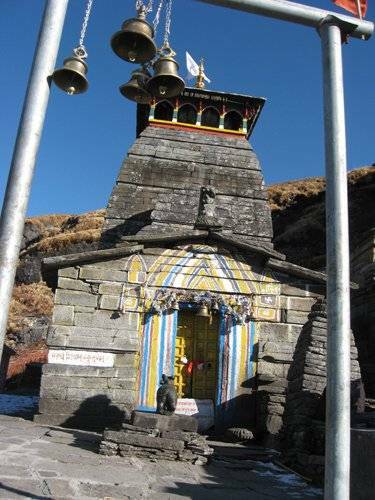 The temple of Tungnath, at a little over 12, 000 feet, is the highest shrine on the inner Himalayan range. It lies just below the Chandrashila peak. Some way off the main pilgrim routes, it is less frequented than Kedarnath or Badrinath, although it forms a part of the Kedar temple establishment. The priest here is a local man, Brahmin from the village of Maku; the other Kedar temples have South Indian priests, a tradition begun by Sankaracharya, the 8th century Hindu reformer and revivalist. Tungnath’s lonely eminence gives it a magic of its own. To get there (or beyond it), one passes through some of the most delightful temperate forest in the Garhwal Himalayas. Pilgrim or trekker, or just plain rambler like myself, one comes away really like before mankind began to strip it bare. It is one of the panch Kedars. The face of Lord Shiva is worshipped at Rudranath temple in a natural rock temple as Neelkantha Mahadeva. Lord Shiva is worshipped here as Neelkantha. The temple is situated amid thick forest at a height 2286 mtrs. 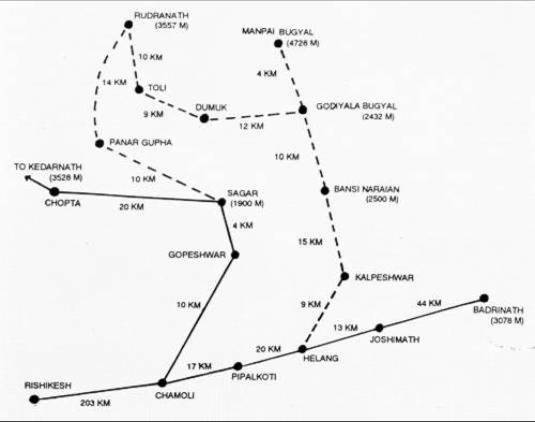 From Gopeshwar 4 kms motorable road is available upto village Sagar from where 20 kms. trek leads to Rudranath and can be approached from Joshimath as well, by trekking about 45 kms. The temple provides magnificent view of Hathi Parvat , Nandadevi, NandaGhunti, Trishuli and many other. There are numbers of holy Kunds (Tanks) near Rudranath temple namely Suryakund, Chandrakund, Tarakund etc. The Baitarini, the divine river flows pass behind the temple. 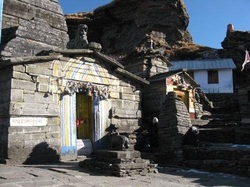 Anusuya Devi temple is located on the trek to Rudranath involving an additional trek of 3km. The hardier tourist may like to trek about 35 km to Kapleshwar, where the locks (hair) and head, of Lord Shiva are worshipped. Located in Urgam Valley at an altitude of 2,134 m. above sea level, the temple is a further 10 km trek from Rudranath to Helong, the motor head on Rishikesh-Badrinath route. The Panch Kedar trek can be completed in 12 days starting from Kedarnath. 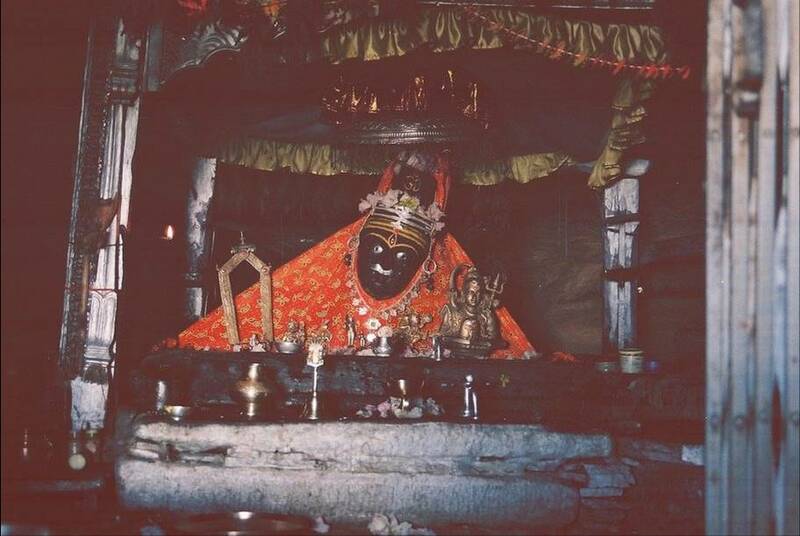 The temple of Kedarnath is widely known for its sanctity. Lord Shiva fled to Kedarnath from Varanasi to escape tha Pandavas and on being detected there, assumed the form of a bull. Bhim tried to pull him, but Shiva sank into the earth and only the hump came in his hands which is worshipped at Kedarnath. Tunghnath is where the arm of the Lord appeared. Set on a crest of a hill, from the temple at Tungnath one can view the surrounding peaks soaring high into the sky. The route is through Chopta where there are ideal places to set up camp on the roof of the world. Situated amidst thick woods, at Rudranath the 'mukh' of the lord's face appeared and Shiva is worshipped as Neelkanth Mahadev. The small rock temple of Kalpeshwar is where the Hair appeared. Short of Kalpeshwar is the picturesque valley of Urgam. Finally at Madhyamaheshwar is the magnificient Shiva temple where the naval reappeared. Bordered by emerald banks, the Madhyamaheshwar River flows through incredible landscapes and snowy peaks.